As I write this, it seems like the popular social network is ripe for exploitation by wineries, and other markets as well. Many brands have yet to focus on Instagram as a viable option for social media marketing, despite reports that “Based on median increases in subscriber growth, user engagement and sales effectiveness, Instagram has been crowned the best-performing social platform of 2013, according to analytics firm SumAll.” It is, after all, the fastest growing social network of the year. Each day its 150 million users upload 40 million photos. The instant sharing nature of Instagram makes it a popular choice for brands that want to showcase their business, products, and lifestyle connections. In the wine industry, many brands are slow to adopt social networks, and that’s certainly the case here. But there are a few that have been making solid headway, and using the platform to grow their brand. Red Cap Vineyards is young winery, born on the hillsides of Howell Mountain alongside other big names like Dunn, Outpost, and Robert Craig. In 1998, the owners purchased 10.5 acres of property in Angwin and planted the first vines in 2003. They craft an amazing Cabernet Sauvignon, the first vintage of which was released in 2006, and a Sauvignon Blanc as well. Out of all the wineries I’ve looked at, they seem to have the biggest correlation between their presence on Instagram and the growth of their brand. As a new brand with no marketing budget, they joined Instagram in February 2013 and quickly amassed a devout following of fans. They networked with fellow wine enthusiasts, influential users, and owners of wine bars across the country to spread the word about their brand and it seems to have paid off. To date, they have more than 800 followers and 400+ photos with the hash tag “redcapvineyards” have been shared. Not a bad show after only nine months on the social network. No surprise to see Jordan as the top of the list of most active wineries on Instagram. They’re a hip, fun winery known for being on top of their game when it comes to social media and online marketing. Earlier this year they created a parody music video for Robin Thicke’s “Blurred Lines” song, which got huge amounts of shares and has 32k views so far. What I find interesting is that while they have a huge amount of followers, relatively speaking, there are only about 400 photos tagged “#jordanwinery”. I notice they don’t always comment on or share photos that others post using the #jordanwinery hashtag, which seems like an obvious opportunity to increase engagement and gain more followers. Whitehall Lane has a strong presence on social media, and their efforts were recently highlighted in great article on Social Media Examiner. They joined Instagram late in 2012, and have started to grow a solid foundation of followers and shares. They take a slightly different approach than other wineries that use the social network, posting a lot more humorous photos meant to create brand loyalty and awareness. Of course, they still promote their wine with crisp bottle shots and images from around the vineyard and tasting room. Taking a cue from the tips below, Whitehall Lane even partners with other brands like GoVino, to promote sponsored contests. They’re also very good at cross-pollinating their social media accounts by sharing across networks, retweeting others’ content, and liking photos from similar brands around wine country with audiences that align with their own. If you post lots of pictures of wine on Instagram, then you probably use typical hashtags like #wine #napavalley or #cabernet for example. But creating your own can be much more useful because it gives you an easy way to search for and track images that use your hashtag, especially from fans and followers. To give you an example, the tag #dirtybandits and #thewinepoor seem to have been adopted by wine lovers who flaunt their Ridge Monte Bello, Colgin, and other small production favorites. 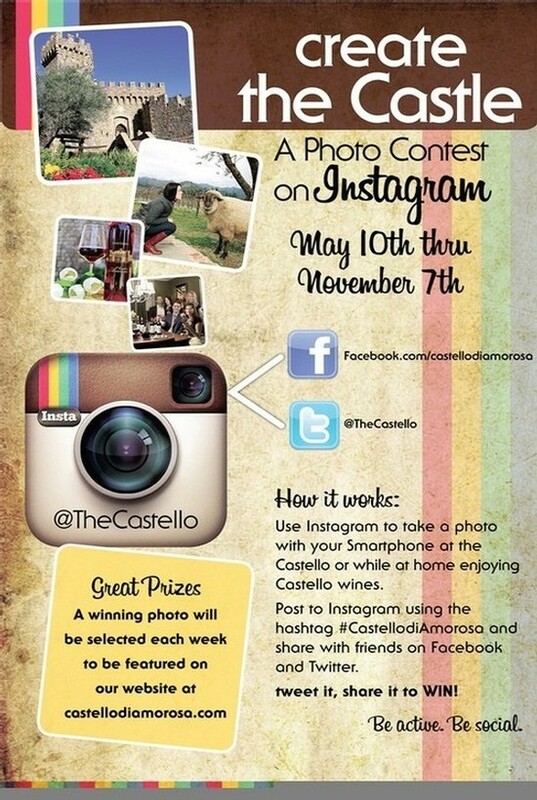 When Castello di Amorosa ran their “Create the Castle” contest, they asked for fans to post a picture of the castle or their wines, along with the hashtag “#castellodiamorosa”. So far there have been more than 9,000 pictures shared with that tag. Think about the exposure that generates for a brand, when nine thousand people actively share and promote their product. The only reward they offer was the chance for your photo to be shared on their website, so the cost to run a contest like this was next to nothing. Sharing photos makes for a great way to showcase different sides of your brand and business. For wineries, this might mean taking a picture of the sun rising over a misty vineyard, or the freshly harvested grapes flowing out of a bin and into a destemmer, showcasing bottle shots, and visitors who enjoy their time at the winery. Be sure to tag those visitors and encourage them to share. Beyond the winery itself, it means sharing behind the scenes pictures of the family dinner, the vacation to Breckenridge, and a dinner at RN74 in San Francisco. Connect with people based on the lifestyle that’s associated with your brand. Use the “find friends” features that come with Instagram to connect with existing fans on Facebook and other social networks. Send an email announcement to your mailing list and encourage them to join you on the network, possibly even to participate in a contest to gain some extra momentum. Use a website or service like Statigr.am or Web.stagram to search for relevant hashtags and browse followers online, which makes it really easy to follow new users and like photos. The more users you follow and photos you like, the more fans will reciprocate the favor. I don’t see many wine brands doing this, but it’s a common trend among larger brands using Instagram. For example, Paypal hosted a series where each week they would invite a prominent figure from some lifestyle or market to be a “guest Instagrammer” who shares their adventures in a certain context. What you need to realize is that while a winery might consider 500-1000 followers a pretty good number, there are users out there with 500k+ avid fans. Check out @alice_gao who shares her passion with 500k+ followers and you’ll see what I mean. Use a service like Nitrogram to find influential users, measure their reach, and monitor your audience growth. Another hint – if you find a user who seems influential in your vertical, scan the list of people who follow them to find more fans who might align with your brand. Do the same for the people who your influencer follows, and you’ll discover the people they admire. I added this one one as well, because on the same day I published this, Instagram announced a new features – direct message. As Techcrunch reports, we can now send private, chat-like messages to other users. You can imagine how this might spawn a new layer of social interactivity between brands and consumers, fans and their friends, and so on. There’s still plenty of room for early adopters on this social network. With the recent advent of Instagram advertising, it will be interesting to watch how brands take advantage of the platform in 2014. Of course this post wouldn’t be complete without me sharing a piece of my own Instagram feed. Follow me @bluedogwine and join the fun.